Business end-users, becoming increasingly accustomed to online shopping in their personal lives, are increasingly bypassing the traditional procurement route and buying direct from B2B suppliers for their work-related requirements. That’s the surprising headline from a recent report and one that highlights a growing trend that throws up some interesting challenges and opportunities for B2B marketers. The revelation comes in a new report from Forrester, The Rise of The Empowered B2B End User Buyer, which was commissioned by Intershop. The study questioned 1,580 end users at managerial level and above who had experience buying B2B products and services online across the USA, Australia, China, France, Germany, and the UK. Respondents were asked how they researched and finalized their B2B purchases, about their expectations of suppliers and about their relationship with their corporate procurement colleagues. The results revealed some interesting aspects of this new breed of non-procurement B2B buyers, christened as “rogue end-users” by the report authors, in several key areas. They have been making online work-related purchases for some time and are regular buyers outside of the procurement process. They are comfortable using multiple payment options including invoice, purchase order, and company credit cards. 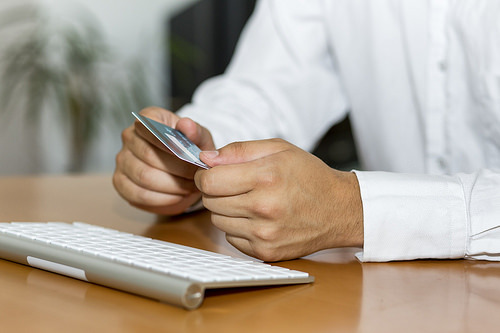 In fact, 58% said that they are comfortable using their personal credit card to complete a purchase. They are comfortable using multiple devices for work-related purchases with half saying they use smartphones. 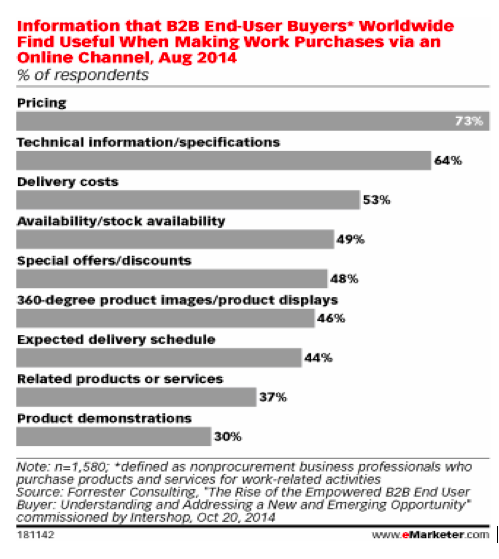 Pricing information is cited as the most useful information for B2B end-user buyers, followed by technical information and specifications as shown in this graphic from eMarketer. What I think is an important takeaway here is relative to your B2B corporate website. Buyers clearly want pricing information above all else, so if you’re not providing pricing information online for these DIY shoppers, or if you’re making them jump through hoops in order to get pricing information, you’re getting in the way of a purchase. Providing information on delivery costs and product availability is also pretty important, so it’s important not to overlook those things as part of the overall user experience you provide on your website. They buy despite increasing procurement controls. Four in ten respondents said that procurement groups were reacting to the emergence of independent buyers by increasing controls. This would seem to be having limited effect with some end-users who expressed frustration with procurement teams who don’t understand their requirements. Three-quarters of the businesses surveyed said that they have an approval authorization process. More than half (57%) said that they have reimbursement policies and 47% approved supplier lists. Despite these policies, 30% of end-users said that they weren’t concerned about the policies and would source what they want anyway. Half of respondents don’t see reimbursement policies as being a barrier to making purchases on their own. The study isn’t clear on whether they are always reimbursed; I’m guessing here that they might not be purchasing big-ticket items with their own cash without some approval in place. End-user buyers expect high standards from sellers. Web savvy consumers are extremely comfortable sourcing and purchasing online, that’s a given. Not surprisingly, these buyers expect the same standards from B2B sellers that they have become accustomed to when buying online outside of work. End-user buyers look for trusted suppliers who offer good customer service, transparent delivery costs, and the right technical information. Competitive pricing is key and buyers also expect to have options for faster shipping and tracking functionality on deliveries. More than half of end-user buyers said that they are loyal to online suppliers who offer and deliver the right experience. One other critical area that the research identified, and one that B2B marketers would do well to heed, is in the area of content. End-user buyers are extremely interested in traditional resources such as technical information, specifications, and instruction manuals. They also value rich media content, particularly video, reflecting the upsurge in demand for video content that are we seeing across the board. 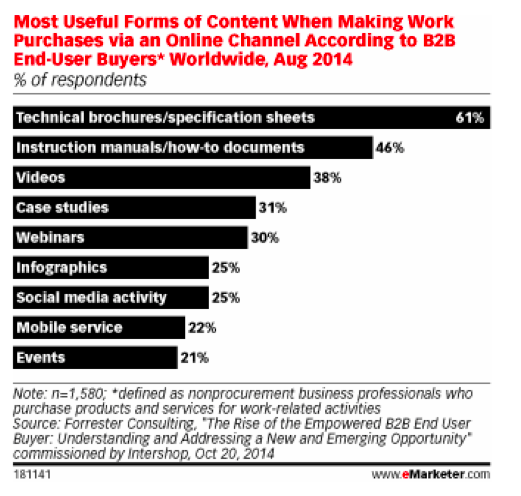 This graphic from eMarketer illustrates the types of content that they find most useful. The bottom line is that we are seeing the emergence of a new class of B2B buyer. One who doesn’t want to explain what they need to a procurement team that they think might not have the breadth of knowledge to understand their requirements. They want the convenience, choice, and product information that they have when they shop online outside of work. The competition is heating up for B2B sellers who are vying with direct suppliers and B2C organizations for end-user buyers business. B2B sellers and marketers will need to be flexible enough to provide the right online buying experience to serve these customers and also focus on aligning their content to the end-user’s needs. One other feature of the changing B2B market that is too important not to mention is the use of mobile devices. Although end-user buyers aren’t yet using their smartphones in great numbers to research and buy online, the rapid advance of mobile devices in the workforce means that they are increasingly likely to do so in the future. I believe that part of the reason they’re not using mobile devices much is because in all too many instances B2B websites aren’t mobile responsive, making the overall user experience and definitely the shopping experience, frustrating at best. For B2B marketers, addressing m-commerce is an issue you’ll need to focus on as part of your multi-channel strategy. It’s happening, with you or without you. B2B marketers (or sales pros), is any of this information surprising to you? Is this a trend that you are seeing in your organization and, if so, what’s your plan in the coming year to modify what you’re doing to serve this customer base. I’d love to hear your feedback.